Block no. 14. 060 complex. 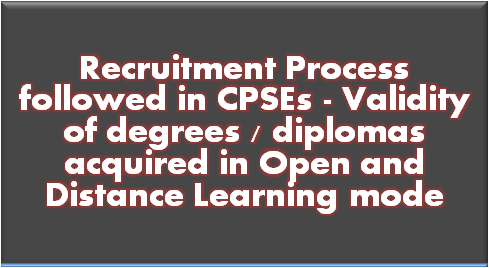 Subject:- Recruitment Process followed in CPSEs. The undersigned is directed to refer to Secretary, M/o Human Resource Development (MHRD). D/o Higher Education DO No.4-17712015-DL dated 13th May 2018 (copy enclosed) regarding non-recognition by CPSE of degrees / diplomas acquired in Open and Distance Leaming (ODL) mode from UGC recognized Universities for the purpose of employment. 2. As recruitment to the below Board level posts are done by Board of CPSEs, the administrative Ministries / Departments of the CPSEs are requested to advise their respective CPSEs to take cognizance of the various notifications / circdars / public notices of MHRD and UGC regarding the recognition of ODL mode degree for the purpose of employment while making recruitment in CPSEs. This Ministry has been receiving many complaints about PSUs not recognising degrees/diplomas acquired in Open and Distance Learning (ODL) mode from UGC recognised Universities for the purpose of employment. 2. In this regard, it is mentioned that Government of India has consistently maintained that degree acquired through ODL mode are valid for employment in Govt. and PSUs. A copy of MHRD Gazette Notification is attached. The University Grants Commission has also issued guidelines/ circular/ public notices from time to time in past for awareness of general public and others on the recognition / equivalency of the 001. degrees with the degrees acquired from regular universities. In this regard, UGC has issued a Public Notice dated 23rd February, 2018. 3. However, for the programmes for which AICTE is the regulator, its approval for ODL courses is necessary. In brief, AICTE does not recognize ODL degrees in subject areas other than management and information technology. But for all other non-professional courses/degrees acquired by individuals from the UGC recognised ODL programmes are valid degrees for appointment to post and services in the Central Government & PSUs. 4. In view of above, I would therefore, request you to kindly issue the necessary instructions to all the Central PSUs and Public Enterprises to take cognizance of the various notifications / circulars / public notices of MHRD and UGC regarding the recognition of ODL mode degrees for the purpose of employment. Non-professional courses/degrees acquired by individuals from the UGC recognised ODL programmes are valid degrees for appointment to post and services in the Central Government & PSUs.